Being nostalgic seems to be in vogue this week so I’ll continue with subject. Back in the old days of ArcInfo (you know like way back in the early 90s ;) ) ESRI used to have a wonder set of printed manuals. These were in nice binders if I recall and were such a great reference (binders lay flat so you don’t have to fight them like the latest ArcGIS documentation). Well in time they have been replaced by PDF and online help, but I can’t help but begin to wonder if the days of even PDF documentation are over. 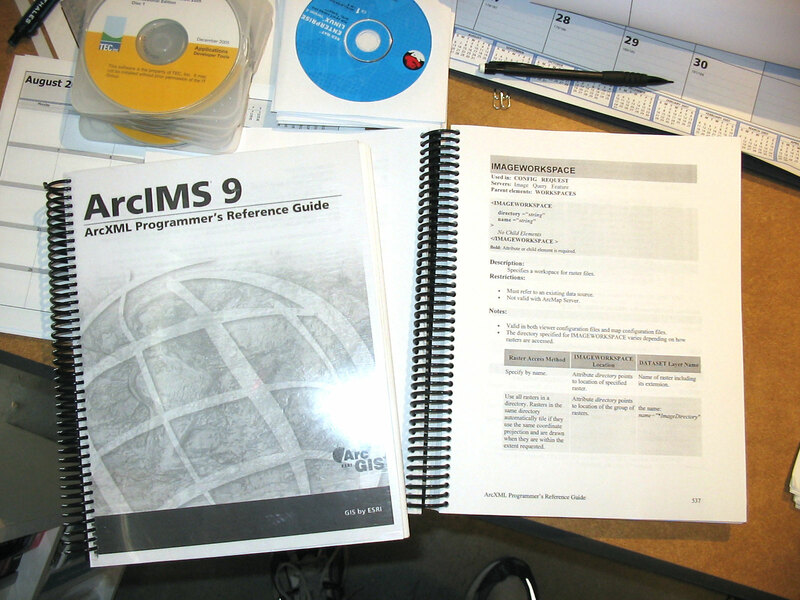 We use the ArcXML reference so much, we paid to have it printed and bound. I’d love to do the same with ArcDesktop help, but I’ve never found a PDF of the whole help to print. I’m guessing there isn’t one and the web help is supposed to be the primary method of getting documentation. I’m left wondering if we’ll be able to print out the AXL reference at 9.2 (I’m guessing not) which is too bad. I’d have no problem paying for printed documentation from ESRI for ArcGIS Desktop and extensions as well as their server products. I don’t expect ESRI to all of a sudden start making documentation, but there has to be a way they can hook up with a printing service where we could order such documentation. Maybe I’m the only one here who thinks like this anymore, but web-based or HTML help isn’t my cup of tea.